So, as I write this, it's Friday, June 22. I'm doing it this early because...I jinxed myself last IWSG post. If you missed that one, you can read it here. I posted that my writing things were going good. 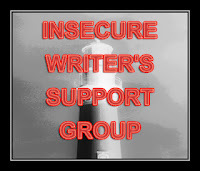 That I wasn't insecure at all, and everything writerly was good. How did I jinx myself? Every day after that post has sucked. Like, super, major, OMG sucked. As I sit here right now, I haven't written a single word on my WIP in a week (at least). The last time I actually did write in it, I barely got through two paragraphs. I'm struggling to finish up revisions and critiques. UGH! I used to go through several chapters of crits a day and now I'm forcing myself to get through one. It's sad and I hate it. I feel like I'm lazy, slacking and failing. I don't like that feeling. No matter how I try to fix it though, I can't. I've been trying and trying and yet nothing happens. It's crap. My friends have said, relax. That it's okay if I take a little time off. For me? It's not okay. I can't relax and be okay with it, not when I have a mile long list of to dos. It just doesn't work right for me. So, I'm beyond insecure this week. But regardless of anything I said in this post...I'm okay with the insecurities this month, like for real okay. I know I'm not truly lazy or failing, it just irks me that's all. I don't like it and I'm hoping to get back on track ASAP. But I'm okay. This too shall pass, and I will be back where I want to be, before I know it. How about you? Are you insecure this month? Have you been insecure lately about anything? Writer or not. I understand this all too well. It's so frustrating, but at least you realize it and know it's only temporary. Sometimes, I do a little bit at a time, even if it's just a paragraph that's not working out. It helps me to not feel so disconnected from the story. This happens a LOT. It is incredibly hard and frustrating because you can't make yourself go through one more word of your WIP because you've just stared at it too long. It happened to me. I wanted to tear my hair out everytime I looked at this one chapter. I think a break helped me TONS. I took a day or two off and didn't do anythign to my MS, and then I went back to it. It helped a lot. One day of nothing is worth 10 days of frustrated writing. It will pass. Sometimes you have to let times like this run there course. Have you tried just writing other stuff. Blog post, short stories, recipes, anything, to get you in the writing mind set. Your WIP isn't going anywhere. You will get back to it when your brain lets you. Also, realize, when it comes to writing and being productive, you have done it before, you will do it again. Everyone says not to do it if it's a first draft, but I edit previous chapters when I'm stuck. Walking away from it doesn't work well for me. Everyone's different. I hope things are better now. We all have times like this, and at least you realise it, and you know it'll pass. That's all you can do. My first IWSG, here to support as I know what those insecurities can do. Also think it's a good way to meet interesting other writers. Darn it! I always want to participate in writing one of these insecurity posts but I always forget about it until I see one of your posts on them again. That being said, there has been lots of moments in my writing career where I could have written this exact post. Although it's my boyfriend who's always saying,"Relax. You put too much pressure on yourself. You're doing fine." Because he's the one I always rant to. I've been very insecure lately about my writing and frustrated with the fact that I'm not published yet. Blech. Hate insecurities. Yeah, I posted in a Facebook group last month about my 10,000 word count bump in my WIP. Can you guess how much I've written so far this month? Sometimes life just gets in the way and we have to just roll with the flow. You'll get back into the swing of things when the time is right. Inspiration and muses ebb like the sea, and it's not your fault. When you've done recharging your batteries, you'll be surprised how much you'll get done.